Playing music is a common need for most drivers when driving. As the rise of streaming music services, more and more people try to play Spotify Music, the most popular streaming music service, in their cars. In this article, we will introduce several ways to play Spotify Music in a car and we are sure you can find a best way to play Spotify music in your car. For some cars, we will need to use Spotify Music Converter below to download Spotify Music songs as MP3 or M4A first, then you can copy to USB drive or burn to CD disc and enjoy in your car. Music and car were connected together when the first car radio was introduced around 1930, and now, music has become an indispensable part of a car. Any modern cars are equipped with audio devices to help drivers listen to music when driving. It's said that music can help drivers to concentrate on driving, though there are also opposite opinions. As the rise of streaming music service, more and more people also discuss about how to play streaming music in a car, especially Spotify as it's the largest streaming music service. Actually, there are several direct ways you can use to play Spotify Music in a car. Bluetooth connection may be the easiest and most convenient way to play your favorite Spotify musin in a car. Any modern cars come with Bluetooth, and all iOS and Android devices come with Bluetooth as well. You can simply pair your mobile phone or tablet with your car stereo system. Turn on your car stereo system, go to your mobile phone or tablet and tap on Settings to find Bluetooth settings. The option may be different slightly depending on the mobile phone or tablet model you are using, but it should be very easy for you to flip on/off button to togget Bluetooth on. Once Bluetooth is turned on, your car stereo should appear in the available device list and simply tap on it. As you have successfully paired your mobile device with your car, you can tap on Spotify app on the mobile screen to start playback. Some cars support auxiliary input, so you can use a cable to connect the mobile device with your car by plugging the cable to the Aux-in port. Sometimes, you may need to purchase an Aux-in supported cable if your original cable doesn't support Aux-in port. Once connected, you can play Spotify music on your mobile device. You need to control music playback on mobile device directly to play a specific song, skip or go back to a track. If you have got a FM transmitter, you can also use it to play Spotify music in your car. Just plug in your FM transmitter to your car or use batteries to get power, connect the audio cable from the FM transmitter into the headphone jack of your mobile device and select a frequency on the FM transmitter. Turn on your car stereo and set FM radio to the frequency you just selected. 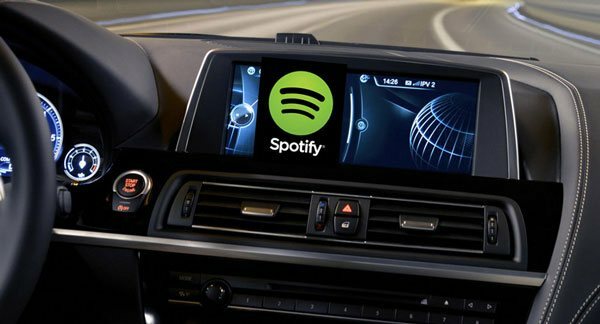 Now play your favorite Spotify songs on your mobile device and the songs will be streamed to your car stereo. Some car models like BMW ID5, BMW ID6, Jaguar Land Rover, Volvo XC90/S90/V90, MINI, 2018 GMC Terrain models, 2017 and 2018 Cadillac CTS models, Waze, etc. are integrated with Spotify. The operations of playing Spotify music in the supported car models are different, and you can check on Spotify's official instructions. You can easily play from Spotify app on your Android phone to your Android Auto compatible vehicle. Go to Android Auto official website to learn more information. Just note that Android Auto requires Android Lollipop, version 5.0, or higher. Log into the Spotify app on your Android phone, connect your phone via USB to an Android Auto compatible stereo. If Spotify is already playing, it will keep playing, so you may need to stop playing first, then start Spotify on your stereo display. You can also easily play from Spotify app on your iPhone to your Apple CarPlay compatible vehicle. Apple CarPlay is available on more than 300 car models and you can check the full list of Apple CarPlay supported models on Apple's official web page. Please note that Apple CarPlay requires iPhone 5 or newer iPhone models. Log into the Spotify app on your iPhone, connect your iPhone via USB to a CarPlay compatible stereo. If Spotify is already playing, it will keep playing, so you may need to stop playing first, then start Spotify on your stereo display or through voice command with Siri. As an in-car multimedia infotainment system, the Parrot Asteroid provides a a foundation for an in-car real-time computing experience. Spotify app is also available in Asteroid Market and you can sync all your favourite playlists to your ASTEROID device and listen offline. Or go online and stream anything you like from the Spotify library. Spotify app in Asteroid Market is available to Asteroid Smart and Asteroid Tablet. Before the rise of streaming music services, we usually play music using a USB drive with MP3 files in it or plug an audio CD to the car's built-in CD player. Such ways are still not outupdated as many people are still playing music in these two ways. However, Spotify is a streaming music service, it is different from purchased songs or burned CD. Even you have subscribed Spotify Premium, your downloaded sogns will be DRM-protected Ogg files, which can't be recognized by car audio system or be burned to a CD disc. 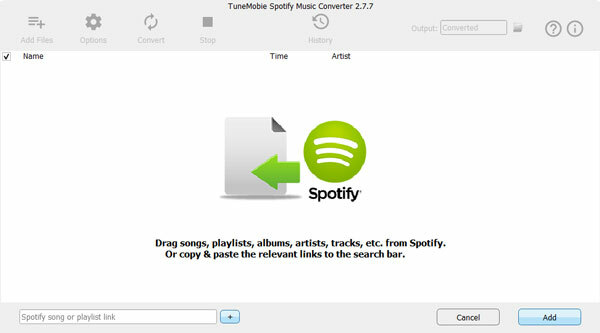 Spotify Music Converter is a perfect solution to help you enjoy Spotify songs in a car using USB drive or CD player because the program can easily download Spotify songs, albums and playlists as MP3, M4A, WAV or FLAC which can be widely used. Besides, ID3 tags like song title, album, artist, genre, artwork, etc. will be fully preserved in the output songs. Spotify Music Converter is extremely easy-to-use, you can get link from Spotify or directly drag and drop songs, albums and playlists to download in bulk. 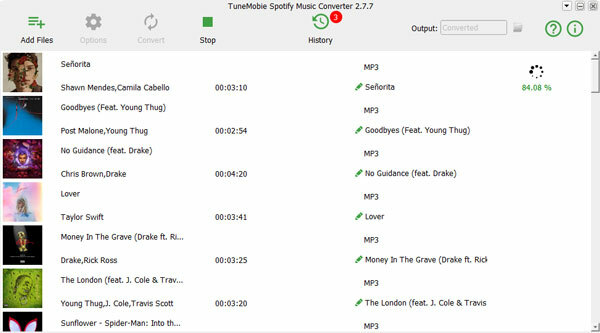 Spotify Music Converter is fully compatible with latest Windows 10 and macOS Mojave. For Windows users, 5X faster conversion speed can be also used. Most of the several ways of playing Spotify Music in a car mentioned above may require Spotify Premium. However, there is a surprise using Spotify Music Converter to download songs as MP3 or M4A because both Spotify Free and Spotify Premium are supported by this dedicated Spotify music downloader. Now download Spotify Music Converter to have a try! With a straightforward interface, any one can download Spotify songs with only a few clicks, no matter Spotify Free or Spotify Premium is being used. Follow the steps below. Step 1: Launch Spotify Music Converter and Spotify will be automatically launched as well. Please do not close Spotify before music download is finished. Step 2: Click "Add Files" button, then drag Spotify songs, albums or playlists to Spotify Music Converter, or copy links in Spotify and paste in Spotify Music Converter. Then click Add button. Step 3: All the songs in the album or playlist will be listed and checked. If necessary, uncheck the ones you don't like. Step 4: Default output format is 320kbps MP3 and it's enough for playing in a car. If necessary, click Options to change outptu format. Step 5: Click Convert button to start downloading Spotify songs, albums and playlists as MP3. You can check and manage the downloaded songs in History tab. Now, you can plug in a USB drive and copy the output songs to it, or use any free CD burner to burn the output files to a blank CD disc. Then plug in the USB drive to car's USB port, or insert the burned CD disc to DVD drive. And now, you have got 2 more ways to enjoy Spotify music in a car.